The Deal jackpot has hit again at PokerStars on Wednesday, February 15 for lucky winner ‘vlmikhaylov’. After spending a little less than the equivalent of $5 in StarsCoin playing The Deal over the course of the week, the Russian claimed a late Valentine’s reward of $87,333.77. The 28,654 players who’d played The Deal in the 12 hours prior to the hit received $3.04 as their share of the jackpot. First prize won by Spanish poker pro Sergio Aido in the Macau Poker Cup 26 HK$100,000 Single Day High Roller. Aido beat a field of 81 players to claim the largest payout and trophy from the HK$7.5M prize pool. German poker player ‘bargeeeld’ banked $120,108.34 in the PokerStars Sunday Million after beating a field of 5,340 players. The total prize pool was a guarantee–beating $1,068,000. PokerStars Championship Macau Main Event packages worth HKD 42,400 are up for grabs in exclusive $10 buy-in Spin & Go tournaments now running on PokerStars. Players can also qualify for PokerStars Championship Macau 2017 through special satellites running until March 26. PokerStars NJ players have the chance to get up to $500 in free cash with the PokerStars NJ 100% reload offer. Players who make a deposit of $20 or more before 23:59 ET on February 19 using the bonus code NJ500 will have their deposited amount matched, up to $500. Episode number of this week’s Poker in the Ears podcast, which is now available to stream or download. This week James and Joe discuss Team PokerStars Pro Igor Kurganov, and the forthcoming launch of Power Up. Plus, Will Ho competes for a hoodie and a tournament ticket in this week’s edition of ‘Superfan vs Stapes’. On March 11, Team PokerStars Pro Bertrand ‘ElkY’ Grospellier and Team Online member Jamie Staples will be streaming a live Q&A at 1pm in the King’s Casino Lounge during PokerStars Festival Rozvadov. The Q&A will be streamed on ElkY’s Facebook page. ElkY will also be holding a freeroll to PokerStars Festival Rozvadov on February 19 at 9.00 ET to win one package including a Main Event buy-in, €300 towards the hotel, and €200 expenses. PokerStars real money tables got a new feature this week. This feature enables players to see hand strength and was implemented in order to aid players in reading their hands, removing doubt especially in the case of Omaha where players can sometimes have difficulty reading hand strength. PokerStars has released a new game, PokerStars Power Up, for technical testing. PokerStars Power Up is a combination of traditional, enjoyable No Limit Hold’em injected with powers that give players the ability to influence how hands play out and change up game play in a variety of ways. 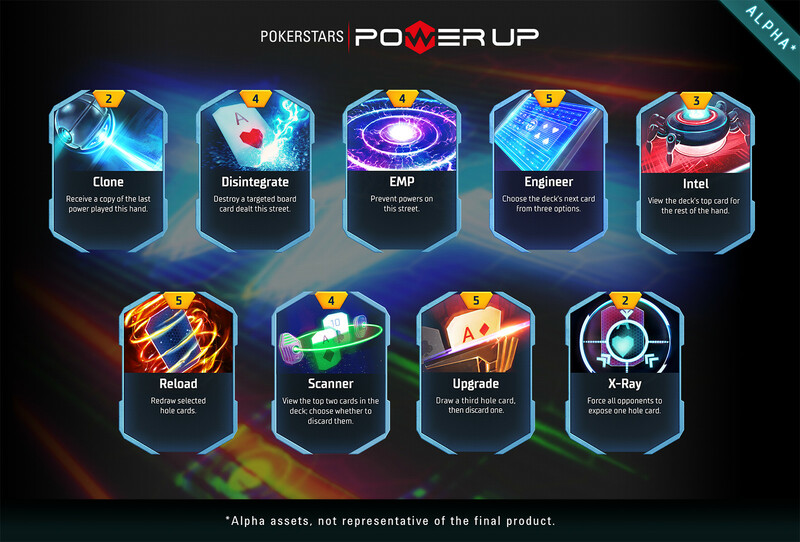 A select number of U.S.-based play money players have been invited to join an Alpha test group to play PokerStars Power Up, which is currently in the very early stages of development. Team PokerStars Pro Jason Somerville shared another of his #winningmoments last week when he took down the Thursday Thrilla live on Twitch. Watch the star hit a Straight Flush and then listen to his unique and quick fire take on the situation straight after. Jcarverpoker is one of three from Team PokerStars who together are dominating the nominations for Twitch Streamer of the Year 2017 at next week’s Global Poker Index Awards. He is joined by Jaime Staples (pokerStaples) and Kevin Martin (KevinMartin987) in the running for the award.